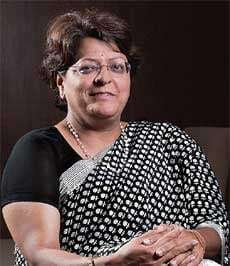 A survey of CFOs by YES Bank and Business Today brought up only one woman's name: Sangeeta Gulati of Educomp Solutions. If women have what it takes to be successful CFOs, why aren't there more of them in big companies? Asked why there are few women chief financial officers , or CFOs, in India, the CFO of a large Mumbai-based conglomerate says: "They are rising to middle-management levels now. They started late." He adds with a smile: "In terms of patience and the right temperament, they have the edge on men," His counterpart at an engineering company says women have the advantage of good negotiation skills. "That helps in investor relations and banking relationships," he adds. So if women have what it takes to be successful CFOs, why aren't more of them in the C-suite? A survey of CFOs by YES Bank and Business Today brought up only one woman's name: Sangeeta Gulati of Educomp Solutions, a mid-sized education company. 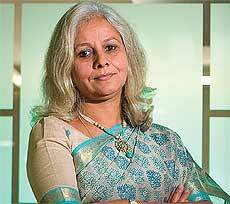 She won in the wealth creation category for companies with a turnover of less than Rs 2,000 crore in 2009/10. Not a single woman figured among the nominees from big companies. Some women have made it to the corner office in the male-dominated world of finance - Chanda Kochhar, Naina Lal Kidwai and Shikha Sharma are well known examples. 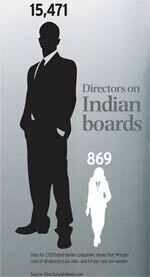 But it is hard to come up with the names of women CFOs in big conglomerates such as the Tata or Mahindra groups. "Those who get into top business schools have their sights set on the CEO's job," says a woman CFO. Since CA is the minimum qualification needed to be a CFO, Gulati says another reason may be that many women CAs set up their own practice or join the family firm. According to Purvi Sheth, CEO, Shilputsi Consultants, the number of women in CFO roles is lower than in other functions, because women in finance generally gravitate towards consulting firms or specialised areas such as M&A. The paucity of women CFOs cannot be just a supply-side issue, because the graduates of professional organisations such as the Institute of Chartered Accountants of India (ICAI) do include women. Almost 40 per cent of students who qualify for CA courses are women. "Many have no female role models," says Vibha Padalkar, CFO at HDFC Life, whose mother was an IAS officer. "I think it's a matter of taking up leadership positions that somehow get constrained by family pressures," explains Shobana N.S., who rose to become CFO of Take Solutions, a small IT consulting and software firm, in May last year. Rupa Vora, CFO of IDFC Private Equity, says women get carried away by family responsibilities. Padalkar, who studied in the UK and worked with Colgate Palmolive and outsourcing firm WNS, says: "Women need to have the tenacity to stay in the race. Many go through phases when they want to chuck it all." "Unlike men, we have the added burden of caring for the kids," says Vora, who completed her CA when she was 22, and at a time when women CAs were rare. But many women CFOs say that it is only a perception that women cannot find enough time for work because of family responsibilities. "I don't think any CEO is comfortable having a woman as a CFO," quips a male CFO. "It's a gruelling job, requiring networking with bankers and long hours of work. Will they be able to take the stress?" "It is more about working smart than working hard," says Vora. "If you build the right kind of team, nobody needs to work long hours." Women avoid switching jobs and taking career risks, which slows their climb up the corporate ladder. "Learning comes from working in diverse environments," says Pratibha Advani, who took over as CFO of NIIT Technologies last September. She wanted to study design, but her father persuaded her to become a chartered accountant. "One thing leads to another, and I started enjoying it," says Advani, who honed her skills at ITC and Barclays. Vora says the right boss makes a big difference. "I was mentored well," she says. All these successful women manage to balance work and family. "I think meditation and de-stressing is required," says Vora, who devotes much of her time at home to her daughter. Advani rises at 4.30 a.m. to walk and do yoga. Padalkar, who has a 12-year-old son, says: "You need your family's support. They're part of your success." Venkat Iyer, a partner at executive search firm Aventus Partners, lists valuable traits of women professionals, including directness, integrity, commitment, carefulness, and risk-aversion. "Women have a natural aptitude to be CFOs," he says. But once in, they face on-the-job challenges that any CFO must deal with. Shobana says that in today's world, risk management is evolving rapidly, and balancing growth and risk mitigation is a tough task. Advani says the challenges most CFOs grapple with today are the shrinking return on equity and capital employed, volatility in financial markets, and deploying surplus cash. For Vora, the priorities are investor relations, strategy planning and risk management. Padalkar keeps an eye on business decisions and budgets. If this lot of women CFOs delivers on the goals they set, they could be role models for others.